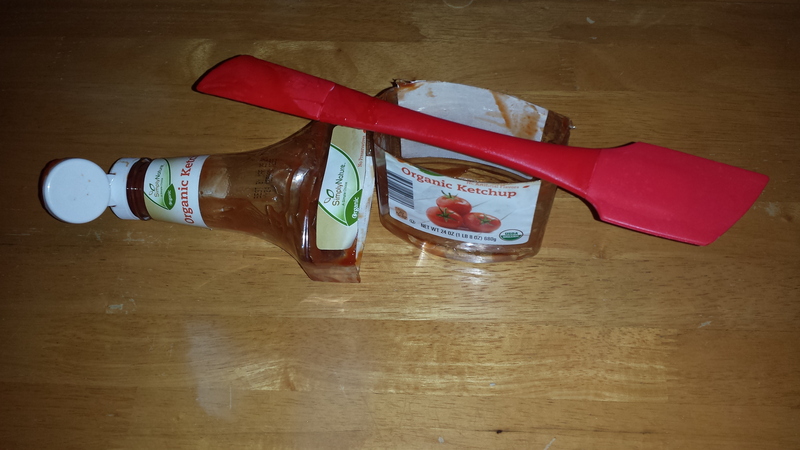 – I cut open our bottle of organic ALDI ketchup and got a huge amount of ketchup out of the bottle for the current meal we were having after I had been repeatedly assured it was “empty.” I try to always use up everything to the last drop and if you don’t do this you will be shocked at how much is left in “empty” product and food bottles. – I used the above Betty Crocker double ended spatula that I love that can be found for $1 at Dollar Tree! I love it so much I own 2 and I think I’m going to buy one for everyone’s stocking this Christmas. – I’m combined a work errand that was an hour away tomorrow with visiting my mom and going to some local thrift shops. Unfortunately, I had to drive an hour each way but I’m glad I can combine work with fun. 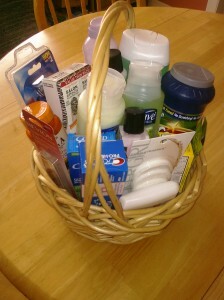 One thing I love to do with my surplus coupon stash is to make gift baskets. Although I didn’t do a great job photographing it, this is a small gift basket I made for some friends of our when they moved into a new place. Most of the items in it are practical- shampoo, conditioner, toothpaste, body wash, razors, comet, hand cream, soap, and a bunch of other items. When you first move, practical personal care and cleaning items can be especially helpful. I also like to give these to people as practical holiday gifts or if I want to help someone out. It cost me almost nothing and my friends told me that they really liked their gift and that they already used almost everything in it. We did exceptionally well this Christmas! I’m very proud of my family and myself for the beautiful Christmas we had this year. Despite having a huge tree and a beautifully decorated house I didn’t spend a cent on decorations or wrapping. My mother had tons of both from years past and insisted on sharing now that I have my own house. 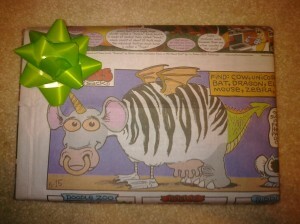 The above picture shows why I love using comics as wrapping! They also save you lots of cutting and money. If you are getting multiple newspapers ever Sunday I look at this as an added benefit. 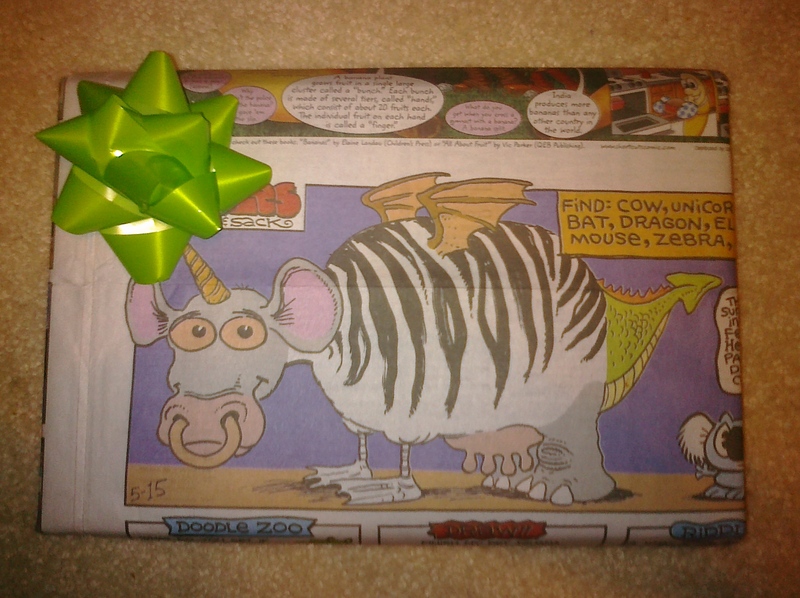 We used the free tape from HERE to wrap gifts. We are also saving bags and boxes from this year for next year. I was asked by a friend to participate in buying gifts for the children at a local homeless shelter and feel very thankful for being able to take part in it. I chose the oldest teenagers because I figured most people would choose younger children. I love, love the gift bags we put together for them with fun and practical personal care items, etc. My sister and I even drove a half an hour to the Victoria Secret Outlet to buy tote bags for the girls for $1.99 each! Thanks to couponing I was able to do this while spending very little money. See the above picture of the items laid out on their bags. I LOVE many of the practical gifts I got this year. The best way to surround yourself with things from the people you love is to have them buy you things you need and use. My brother bought me a cast iron skillet (we are trying to avoid Teflon), my father got me stainless steel pots (again, trying to avoid Teflon) with lids and best of all a buffet food warmer since my new favorite hobby is making dinner for lots of people. My mother got me a small suitcase for weekend trips and my boyfriend got me a huge roller board suitcase for when we make long trips. 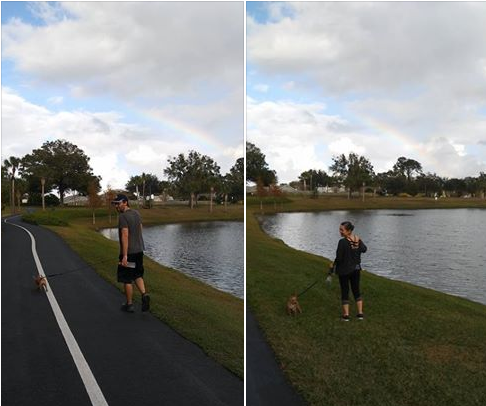 These were both great because we LOVE to travel. Traveling is one thing I feel it is very worthwhile spending money on. My aunt got me a sewing machine which I have been wanting for some projects that I know I can accomplish once I figure out how to use it. My sister got me some really great household and personal care products as well as lots of picture frames which I will use all through my house. 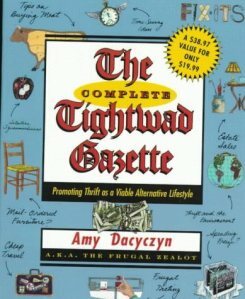 My boyfriend also bought me my very own copy of THE TIGHTWAD GAZETTE!!!! (I wrote about it HERE). For those who don’t know, it is the frugal living bible. I am so excited. I read it when I got it from the library and wanted to buy my own copy for a year but I never expected to get it as a gift. I love rereading it and also being able to write in my own notes this time. 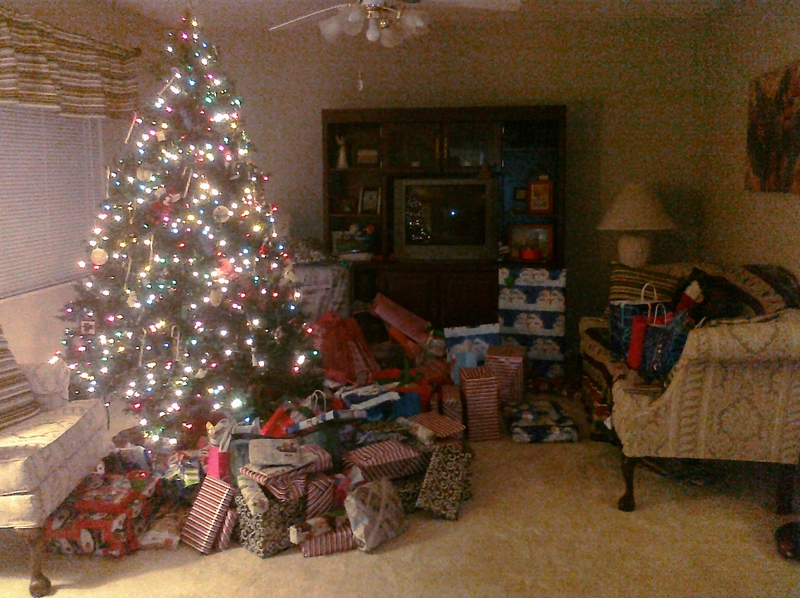 None of us went into any debt to buy any gifts, because we used so many frugal strategies. Including, using gift cards, shopping sales, giving free with coupon household items, shopping at dollar stores, and many other ideas you can see here (30 Ways to Save Money This Holiday Season). We all ate and made tons of food which cost us very little after couponing and discounts and stocking up when there were good deals through the year. Now I have lots of leftovers that will save me from having to cook for days and I will probably still have some to freeze for later. I bought an extra ham and turkey this holiday season with a steep employee discount from the place my mother works. I have kept them frozen and I hope that this will help offset some of our meat grocery costs in the coming year. Right now, I feel like I never need to go shopping again! I have everything I need and can’t imagine needing anything else (at least not anything I can’t buy with the many gift cards I now have lol). I know this feeling won’t last long but I’m going to try to hold onto it because I am so lucky to be so blessed. P&G is offering a $20 mail in rebate for people who purchased $50 worth of certain P&G products before coupons. The picture above shows what I purchased that was included in the deal. I wasn’t going to do this deal until I realized that I had already done P&G deals worth $38 before coupons so I decided it was worth my time. All of the P&G beauty products I bought were for Christmas gifts or things I will use. Click HERE to go to this deal’s website. The link to the rebate is in the top banner. Being broke and living more frugally teaches you a lot. I am refusing to use the heat in my apartment unless absolutely necessary and another benefit of cooking myself is that using the stove warms up my apartment. Not using the heat and obviously not using the air conditioning will save a lot on my electric bill this month. When I’m cold now instead of running for the thermostat I dress more warmly, I use throw blankets when I sit on the couch, and there is an extra blanket on my bed. 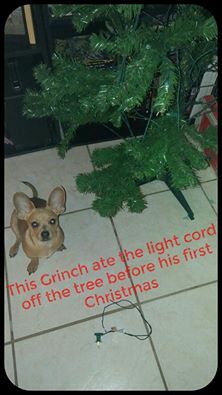 In my living room is a Christmas tree and decorations that my roommate borrowed from her grandparents. 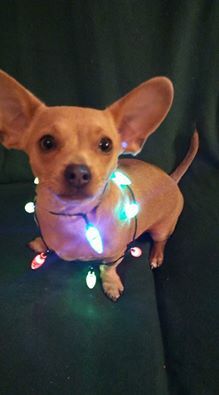 We can even do Christmas cheer on a budget. My brother and I decided, after hauling too many boxes of surplus Christmas stuff into our mother’s attic last year, that no one in the family is allowed to buy anything that has to be packed up again after Christmas. 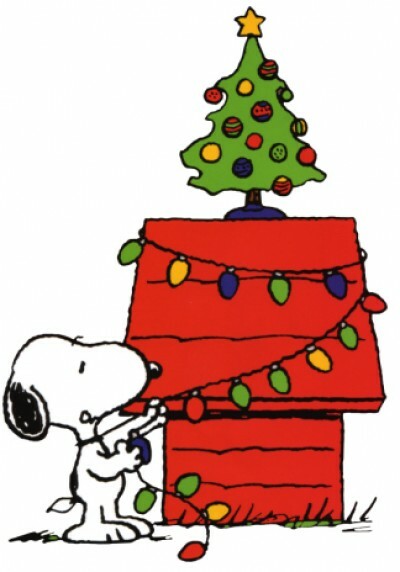 It will be a more practical Christmas than ever before but it will still be fun. This year I went so far as to ask my loved ones a few months before Christmas what they really, really needed or wanted. I think I’ve done a good job with that list. Hidden behind the couch in my apartment sits the stack of Christmas gifts I’ve been collecting for the last six months when I found things that for the right price that I knew my loved ones would enjoy or could use. I have become an expert at Christmas shopping on a budget. 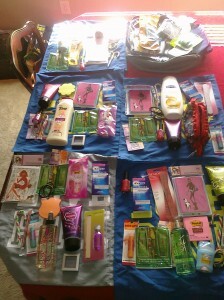 Many of the items I’ve collected have been free through couponing including personal items and stocking stuffers. I have new clothes for my family that I bought at Rue 21’s $3 clothing sale. I have best selling/collectible books that I bought for .10 cents to $1 at thrift shops and the library book sale. I got four free gifts when my Borders reward card gave me a free $10 gift certificate. I got two gifts for about $1 when I found a free $5 Hallmark printable gift certificate. I bought items such as headphones at CVS when they offered them free after CVS dollars. I hit up the $1 sale at Claire’s. I used coupons to get items free at Bath and Body Works with any purchase, usually buying the new sample fragrances for $1 in order to get two gifts for $1. I followed sales and used my resources. My work is giving away a free $20 gift card each shift to the person who gets the most people to give them their e-mail. I did my best with this every shift when most people weren’t even trying. So far I’ve won 6 of them. I will use them as gifts or to buy gifts for free. My couponing has provided me and my loved ones with so many household products that I will be making Christmas gift baskets for other families for free. Sure, there are things that I would love to buy my loved ones that I can’t afford right now but then I would love to give them the moon and stars too, but I know they will settle for the small mountain of gifts that I have amassed as cheaply as possible.